Unveiled in the 2018 Geneva International Motor Show, the Zenvo TSR-S is one of the most innovative hypercars (a more advanced version of a supercar) that you’ll ever encounter. It has a signature rear spoiler which actually tracks and moves when you steer. It is just as fast as a McLaren Senna or Koenigsegg Agera RS with a price tag that tops seven figures. Pricing is obviously a mystery now, but this supercar is definitely of the “if you must ask then you can not manage it” variety. 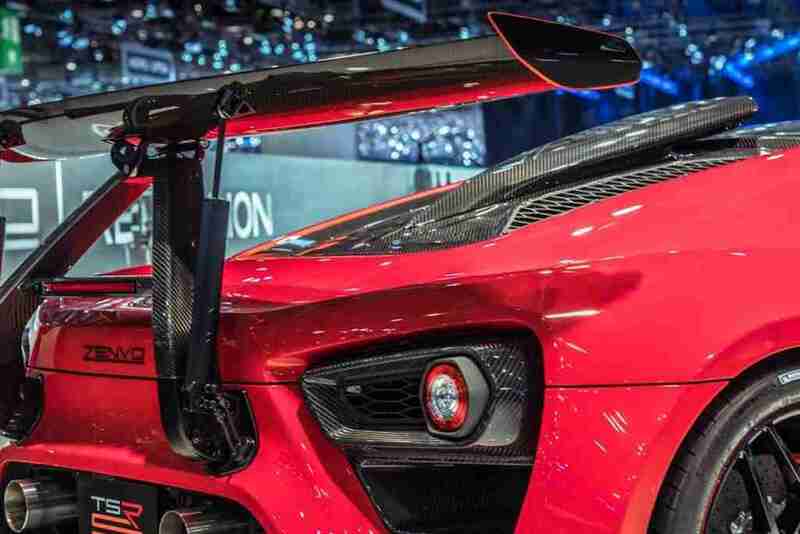 Together with the TS1 GT priced well over the $1 million dollar mark, this new exotic hypercar with the fancy rear wing could fetch close to $2 million before it’s all said and done. With less than five vehicles intended for production annually and limited top speed of 202 mph, the 2018 Zenvo TSR-S will surely be one of the rarest and fastest four-wheel super exotics that money can buy. Danish hypercar manufacturer Zenvo has recently debuted their new road legal TSR-S. The “S” stands for street, with this particular vehicle slated between the TSR race car and the TS1 GT. The TSR-S has an all carbon-fiber body and weighs only 1,494 kg, which makes it blisteringly fast. It provides a belligerent, rumbling sound from the back to match the sharply sculpted appearance of the front fascia and grille. Display models with this supercar on steroids feature super-wide Michelin Pilot Sport Cup 2 tires with huge 21-inch wheels at the rear and 20-inch wheels at the front. This quick two-seater is ready to be put through its paces on a racetrack or it can cruise the street with power outputs which may be scaled up or down along with an active rear spoiler wing that moves as you’re driving. The science supporting the Zenvo TSR-S Centripetal Wing is intriguing. The title ‘Centripetal’ refers to the centripetal force also called ‘center seeking’ force. When in a totally horizontal position, a standard rear wing creates a downforce vertical to the horizontal position of the wing: complete vertical. When the centripetal wing tilts away from the complete horizontal, the downforce stays perpendicular to the plane of the wing hence creating a centripetal force. This centripetal force reduces the tendency of the back end to break away – a feature that’s inherent for a mid-engine vehicle. 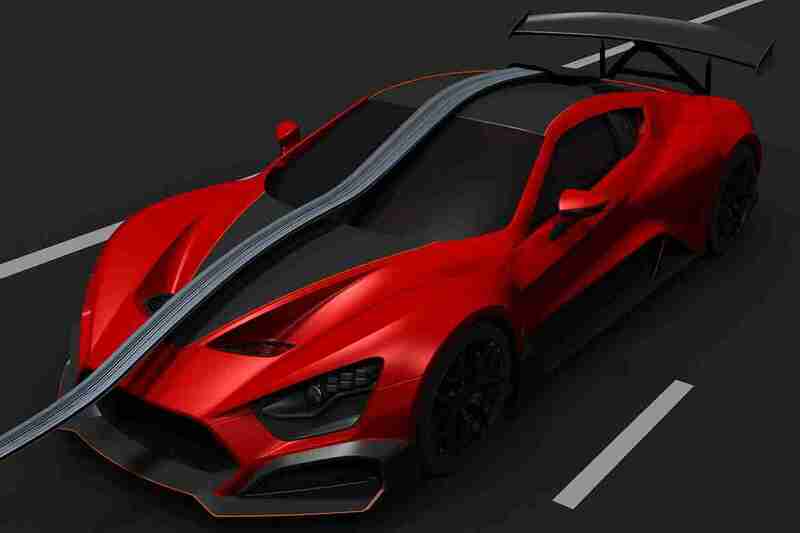 While Zenvo thinks the Centripetal Wing on the TSR-S is a brilliant idea, I’ve read mixed reviews. Expert race winning engineers from various forms on motorsports including IndyCar, NASCAR, and IMSA seem to think the active rear wing would try to roll the car and warp the car by causing a diagonal dynamic corner weight change. What makes the Zenvo TSR-S hypercar stand out from the other elite supercars is the centripetal wing. It’s rather big and dramatic. The wing sits on a central pivot point and actuators aligned on either side will push, pull, and flex the wing based on your steering input and other factors. The wing pitches and tilts toward the back wheels in turns for additional downforce. In actuality, Zenvo claims the inner-most rear wheel will have 30 percent more rubber on the road in ideal circumstances. The wing may also tilt upward to be the air brake for deceleration. Now, this is not the first wing to proceed. The super-fast and super-expensive Bugatti Chiron has a wing which could also tilt upwards, but the TSR-S takes it to a whole other level. The front mesh grille of this Zenvo TSR-S is somewhat broad and feeds air straight toward the motor. The lower end of the front bumper has two aerodynamic splitters on each side which optimize front downforce by redirecting air to the big intercoolers and channeling it away from the front wheels. That design motif continues across the profile of the car with pronounced front wheel sockets and side skirts that masterfully shape and control the flow of air around the vehicle. The back of the body also has an upgraded diffuser and air scoop. The TSR-S has been completely redesigned and re-engineered for optimal aerodynamic performance. This, along with a further enhanced active rear differential and an advanced traction control system, aids the TSR-S to deliver an unrivaled functionality on the street, for a genuinely distinctive hypercar experience. The powerhouse of this Zenvo TSR-S hypercar is a twin super-charged 5.8-liter V8 motor found in the back of the vehicle. Protected by a cross-brace of carbon fiber, it stays deep into the framework. It puts out a shocking, eye-popping 1,177 brake horsepower at 8,500 rpm. It is handled by a 7-speed gearbox that could propel the Zenvo TSR-S from zero to 62 miles in only 2.8 seconds. Now, bear in mind that this is a street-legal car and you may not need to dial-up four-figure horsepower to your weekend ride up the coast. So, there are 3 different power configurations. You can dial it back a bit and opt for low horsepower; place it in IQ mode and you receive maximum torque to the rear wheels and unleash the monster with a full-out maximum power delivery. All that power is reined in by super-sized aluminum caliper brakes. Exact specs are 395 millimeters in front and 380 mm out back. Further placing the car apart from its rivals, the TSR-S integrates manually-adjustable functionality settings including a variable power output. Additionally, the distinctive double gearbox setup can switch between a typical street gearbox configuration and a barbarous mechanical direct power-shift race setup which delivers a real race car experience on the track. The Zenvo TSR-S has no door handles. You have to access the inside by pressing a Hidden button on the door sill. The interior of a Zenvo TSR-S is reminiscent of a sci-fi fighter plane cockpit, and a key that looks like a video game cartridge Is inserted into the center console to begin the vehicle. The Zenvo TSR-S interior is quite dark with the show car version sporting some serious carbon-fiber paneling together with black liner and red accent trim. The steering wheel has a flat-bottom motorsport design with paddle shifters behind the steering wheel, not in front. A manual switch toggles the gearbox involving ROAD and RACE modes on the right, and also you have controls on the left to your horsepower distribution. There’s a large digital display to the instrument cluster and another electronic screen, which sits high in the center stack, may be removed and converted into a touchscreen tablet. The Zenvo TSR-S hypercar prices about 1.7 million USD, with highly limited manufacturing — fewer than five vehicles annually. It’s an aerodynamic design showcase, the centripetal wing which makes it a master at taking comers. It’s also got three power-levels because every event does not call for nearly 1,200 horses. The exterior design is very sharp and competitive. The inside is forward-thinking and minimal. Future owners of the street-legal racer will find a paint-matched racing helmet, a carbon-fiber champagne bottle and the bragging rights of a true race car driver. You can personalize the Zenvo TSR-S by taking out the air con, navigation, and other weighted things, but why would you? This vehicle is guaranteed to dominate the competition in its current form both on and off the track regardless of weight.